Family House Sleeps 10+, Five double bedrooms, 4 bath/shower rooms, large sitting room with 2 open fires. Conservatory, modern kitchen, dining room. Five minutes to pub/water/coastal cycle route/Chichester. Large enclosed garden, pets welcomed. Heated Swimming pool and hard tennis court to enjoy on site. Book ahead now for Christmas and New Year and for popular times of year to avoid disappointment. 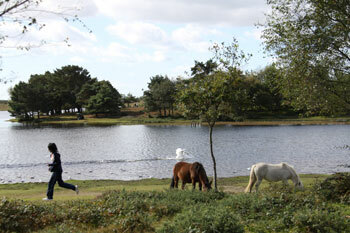 The beautiful New Forest area on the Hampshire coast is a superb outdoor recreation area for all types of holidaymakers and tourists. Some people visit for the day, which is fine for those who live within an hour's drive. For those who live further away, it is advisable to rent a pet-friendly cottage in and around the New Forest to have a few pleasant days to explore the various parts of the forest and its villages. Encounters with forest ponies are very common because they essentially wander where they wish, generally in small groups. For visitors, encountering a group of ponies is a delight because there are few places in England where ponies are able to survive in the wild. There are numerous walks and places of interest. The giant American Redwood trees are a novelty that should not be missed. They are already large enough to stand out from the other trees in the forest. Dogs love to scamper through woodland and there are miles of trails to do so. The open heather clad heath is a surprise to people visiting for the first time because it is unexpected. The mainly pink heather flowers in August; a very pretty sight in late summer. The forest consists of mixed woodland, it's attractive and alive with bird song. Find a rural cottage or farm cottage to rent somewhere near the New Forest in Hampshire and enjoy a self-catering break in the country. There are several quite lovely New Forest villages to explore and for a change, have a day on the beach at Milford on Sea or Barton on Sea. 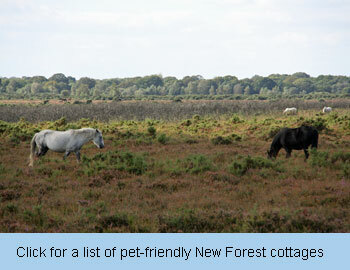 Because of the number of visitors to the New Forest, a well established hospitality industry makes people feel welcome. There is a wide choice of pubs, tea rooms and restaurants, all most appreciated during a holiday even if self-catering; we all enjoy the occasional lunch out.